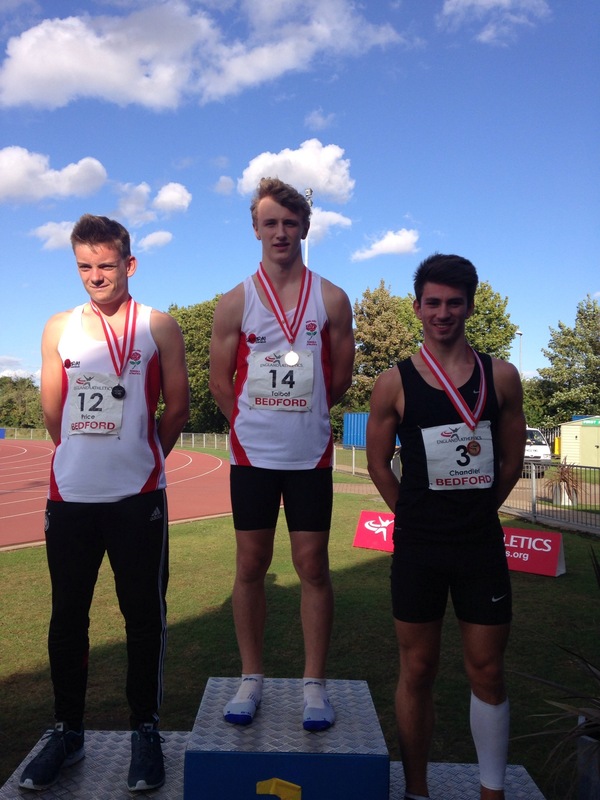 Exeter Harriers 15 year old multi-eventer Sam Talbot has taken his athletics career one step further with a tremendous battle right to the final event to secure the national age group combined events title. Competing as an U17 the norm for this age group is the 2 day Octathlon, but England Athletics push their rising stars further in their quest to secure this prestigious national title. Talbot’s aim was to better Commonwealth Games silver medallist and training partner Ashley Bryant’s U17 score of 5894. Day two saw Talbot refuse to relinquish his lead, and he set himself up well with an outstanding win in the 100 hurdles in difficult weather conditions. Following a new lifetime best in the discus Talbot led by just 2 points, extending this by a small margin of 27 points following the pole vault, which saw another new best in Talbot’s 3.30 clearance. “The pole vault was delayed – rain, hail, thunder and lightening. I was waiting before each attempt for the wind to die down.” Talbot lost the lead in the penultimate event, the javelin, throwing 37.84 to Price’s leading throw of 45.10 but Talbot’s superior personal best over Price in the 1500 meant Talbot had to be consistent and achieve a fast time in the final event to have a chance of the title. ” I knew I had to beat Max by 15secs to win the competition. It was tough with strong winds.” Talbot did not disappoint, and pulled along by Tom Chandler of Central AC who has the faster time overall, Talbot secured the title by a margin of 155 points over Price in second and Chandler in third, and his ultimate aim of a score higher than training partner Bryant achieved at the same age.